They were prompt, straightforward, and honest. I got exactly what I paid for, and they were knowledgeable. I didn't feel like I was getting the runaround. It was great. They got the job done quickly. They are high quality and pay attention to details. They are friendly, on time, easy to work with, and everything went smoothly. 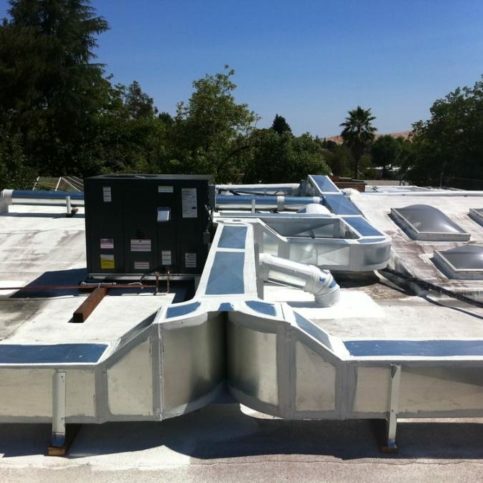 AIS Heating & Air Conditioning installs and repairs all types of HVAC systems for residential and commercial clients in Santa Clara, San Mateo, Contra Costa, and Alameda Counties. 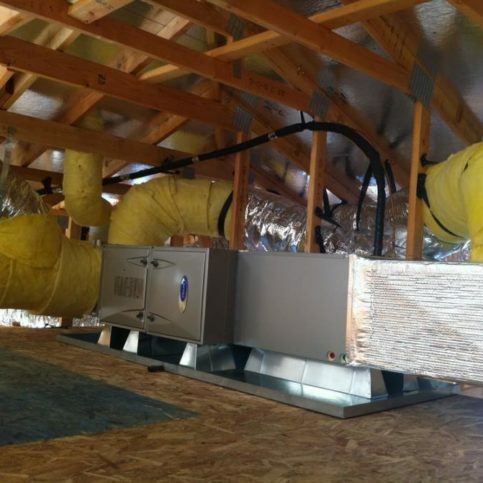 In addition to its heating and cooling capabilities, the company has the training and equipment to work on water heaters, clean air ducts, perform energy audits that help customers improve their indoor comfort and reduce their energy bills, and more. 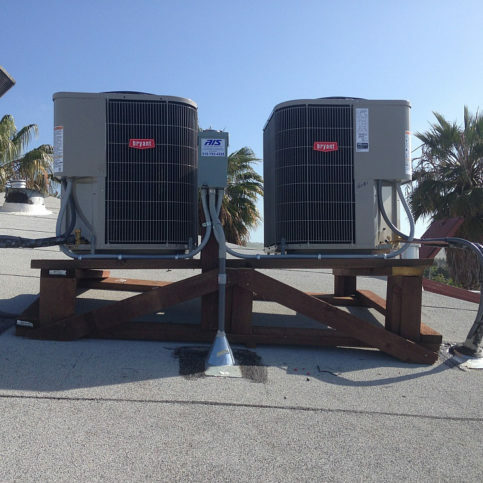 AIS Heating & Air Conditioning installed these air conditioning systems on a 120-year-old building in Fremont. 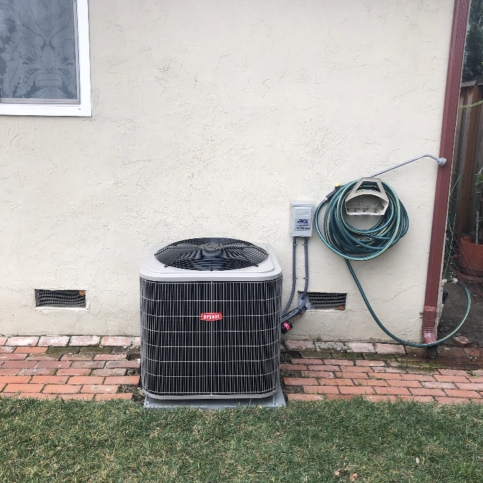 AIS Heating & Air Conditioning has been installing and repairing HVAC systems for residential and commercial clients throughout the Greater Bay Area since 2008. The company also has the in-house capabilities to work on water heaters and air ducts, and its energy audits are designed to help customers improve their indoor comfort and reduce their energy bills. Have your system serviced annually. 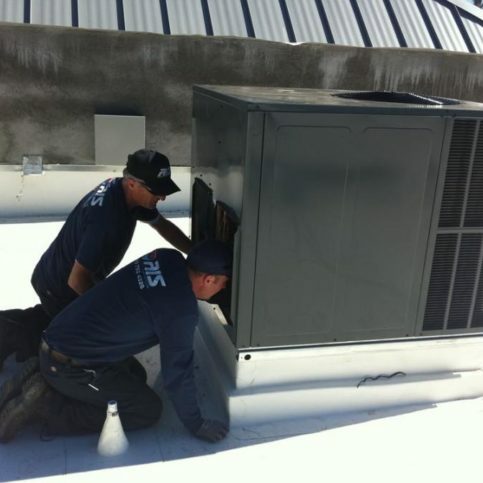 Regardless of how often you use your HVAC system, having it serviced by a professional once a year will help ensure ongoing efficiency and prevent unexpected failures. Clean your air filters once a month. Dirty air filters restrict the flow of air, which can strain your HVAC system and result in higher energy bills. You should also have your ducts checked for leaks, which can allow hot or cold air to escape before it arrives in the intended rooms. Windows, doors, and holes around plumbing and wiring may also be air leak culprits. Keep your heating and cooling registers free from obstructions. Placing furniture and even draperies over the registers can make your HVAC system less efficient. Your rooms may feel colder because the hot air doesn’t circulate as well, and it can cause your system to work harder than necessary. A: Typically, we can come out on the day of your initial call or the day after. Q: Do you pull permits? A: Yes, we pull a permit on every job. Q: Can you give me a price over the phone? A: We don’t like to give pricing over the phone because there are so many details to take into account. Instead, we’ll meet with you in person to discuss your options and provide you with a free, in-house estimate. Q: What type of equipment do you install? A: We’re a certified Bryant dealer, so that’s the main brand of equipment we install. A: Yes, we provide a 10-year parts warranty and a five-year labor warranty. 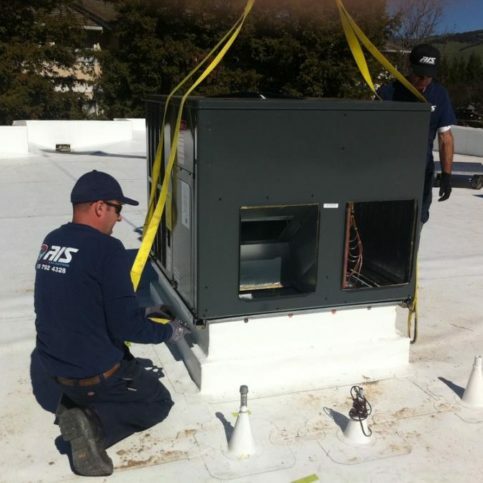 An AIS Heating & Air Conditioning technician installs a new commercial unit on a roof. Owner Daniel Sojkic (L) and his son work on an HVAC unit. 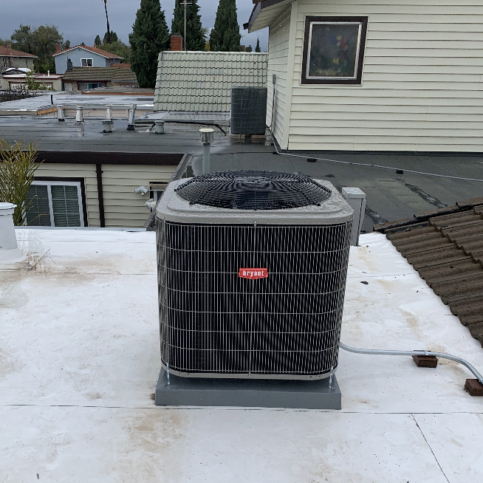 AIS Heating & Air Conditioning installed this HVAC system in a home in Fremont. 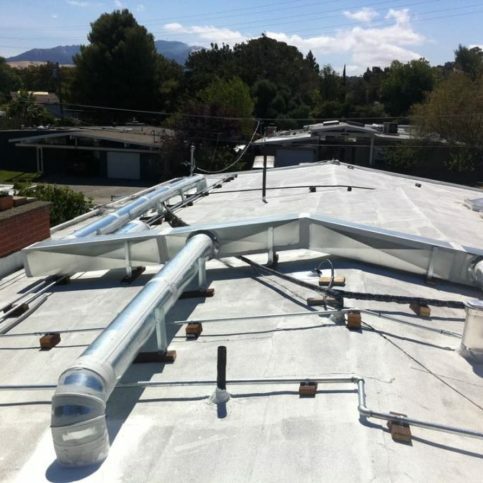 This house has no crawl space access or attic, so AIS Heating & Air Conditioning installed the HVAC system on the roof. Daniel Sojkic is a longtime veteran of the HVAC industry and owner of AIS Heating & Air Conditioning, a Diamond Certified company. He can be reached at (408) 758-5690 or by email. A: Claim Jumper in Fremont. A: Alaska. I went there last year on a fishing trip and it was awesome, so I plan to return the next chance I get. A: Pancakes with eggs and sausage—I can never have enough! FREMONT — When purchasing an air filter for your HVAC system, you have a lot of options to choose from. One important thing to know about is the Minimum Efficiency Reporting Value (MERV) rating scale, which is used to assess filter effectiveness. With MERV, filters are rated on a scale of 1 to 20, with 1 being the least effective and 20 being the most effective. For example, a MERV 3 filter can capture 70 to 75 percent of basic airborne particles like pollen, dust mites and pet dander, whereas a MERV 8 filter can capture more than 90 percent. Filters rated MERV 9 to 11 are also able to capture mold spores, smog and odors, and those rated MERV 13 to 16 add smoke, bacteria and allergens to the target list. At the top of the spectrum are MERV 20 filters, which can filter down to the size of airborne viruses. While a higher MERV rating means greater effectiveness, it also means a greater expense, which is why you have to weigh cost versus benefits when purchasing one for your home. Keep in mind that anything higher than MERV 16 is excessive in a residential setting, as these are designed for use in highly sensitive industrial or laboratory settings. You should also make sure to get a filter that’s appropriate for your HVAC system, as an overly restrictive filter can inhibit proper airflow, which can cause the system to malfunction. FREMONT — Host, Sarah Rutan: When it comes to choosing a furnace filter, there are more options available than you might realize. Today we’re in Fremont with Diamond Certified Expert Contributor Daniel Sojkic of AIS Heating & Air Conditioning to learn more. Diamond Certified Expert Contributor, Daniel Sojkic: As you can see, there are many different air filters that you can choose for your home needs. This is one of the basic air filters out there in the market that you can grab from any local hardware stores. As you can see, this filter, you can see right through it. So it does not collect much of the dust – anything that doesn’t get collected by this air filter, you are inhaling that dust. This is a grade higher air filter, which has a MERV-8 rating – so it’s a really decent filter. It costs few more dollars than a basic air filter. But it’s much better air filter. Next filter that we have, it’s called electro-static air filter, this a really good filter for about two years. Take it out every two to three months, just hose it off, let it dry, put it back, and you’re good for next three months. This is one of my favorite filters. Has a MERV-11 rating on it. This filter – it’s included in all the wire installations that we do, and this is filter is good up to a year depending on the usage of the system. This is one of my favorite filters. This right here, it’s Bryant-perfect air. This has a MERV-15 rating. It’s great for allergies, dust, pollen, any bacteria in the air. This is the filter to go with. The cartridge in here – it’s good up to a year depending on the usage. AIS Heating & Air Conditioning : Average 9.0 out of 10 based on 150 unique customer surveys of customer satisfaction. They did a great job, they were on time, very friendly, and overall good experience. They did everything nicely, great quality of work. Customer satisfaction, they did a great job. They were very professional, on time, clean, organized and very good. The on-time aspect, worked diligently and quickly, and they were helpful and professional. The workers are nice and the quality is good. I would say, courteous, arrived on time, got the job done, and explained how to use the A/C and heating. Great company, very well versed in what they do, and didn't try to upsell me on something I didn't need. Gave me what I wanted and needed. Price is competitive, owner came to the house, and proven to be responsible. Price is good and there is a longtime warranty. They're very professional, and dedicated to their job. Very knowledgeable and they finished the job in a timely manner. Good communication with the team, I submitted a request to finish a project, and they finished the next day. I was happy about that. Professional, knew what they were doing, the staff that came over to the house was courteous and great. When I called the office, they were responsive. They know their job and what needs to get done, they're fabulous. I would say, don't hesitate to call. Did permits and everything was professional. All I had to do was write a check. They're fantastic. I would say, the quality, everything installed properly by the book. 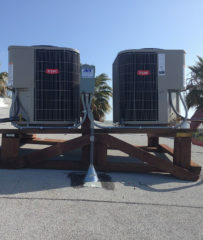 I had an HVAC to install, they were very professional and polite, and worked with me. Very professional and did good work on the furnace. They were focused on creating the job. Bang for the buck and level of service unable to get from anyone else. The ease of working with them, they showed up. I had a question and someone came out to look at the heater, and it was user error, and they didn't charge me. They were fantastic. He came out, did the work, and he didn't second guess anything at all, as I had to wait for the insurance. They went above and beyond. They were fantastic. We were not even here, and they did 90% of the work. They seem to be dependable when I call them for a service call, and they are reliable. They are price competitive. Very efficient, and their quality of work was excellent. Their products were excellent. We had a great experience with them. They were efficient, and they kept with their appointment time. They cleaned up nicely when they were done. They are a great company.